70 years is something to celebrate. 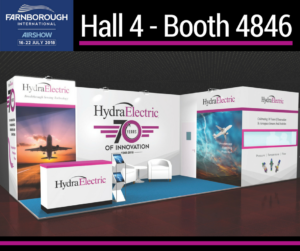 And, at Hydra-Electric we’ll begin celebrations for our 70th anniversary at the Farnborough International Airshow [FIA] July 16-22. Hydra began 70 years ago by contributing innovations in switch technology to the aerospace industry. Today, we continue the push forward with innovations in our sensor and switch products to meet the changing demands of technology. That’s why we’ll be introducing new high performance sensor and switch solutions at #FIA2018, one of the world’s largest aerospace trade shows. This year we’ll be in Hall 4, Booth 4846. Schedule a meeting time at FIA with Hydra-Electric. The Farnborough International Airshow is held every other year just outside London since 1920. The trade show portion attracts 73,000 industry professionals from a range of aerospace sectors across the globe, over 1,500 exhibiting companies, and trade visitors from 72 countries. FIA gives team members at Hydra-Electric the opportunity to meet with international customers, and to develop new industry relationships. We also get to demonstrate the innovations that make Hydra-Electric stand out in the sensor and switch marketplace. We like to think of these as examples of how our company is on the forefront of creating next-generation technology. This entry was posted in #FIA2018, 70th Anniversary, Aerospace Events, Aerospace Industry Events and tagged 70th anniversary, aerospace engineering, aerospace industry, aerospace pioneer, aerospace trade show, aircraft engineering, aircraft sensor design, Farnborough, Farnborough International Airshow, FIA2018, Hydra-Electric products, Hydra-Electric sensors, Hydra-Electric switches. Bookmark the permalink.